Please note that I have now placed the GPSMAP 276Cx on my Recommed List based upon the latest updates, v3.60, to the software. There are still some issues with some Garmin Maps regarding map redraw performance but many user are finding performance acceptable. When Garmin introduced the original GPSMAP® 276C in 2004 it was arguably the beginning of the GPS-era for Dual Sport and Adventure Riding Motorcyclists. The 276C-series appealed to us because it had the basic features we wanted - rugged, battery or hardwired power without compromising its waterproof and dustproof features, a reasonably high resolution color display, support for Waypoints, Routes & Tracks and above all, a glass display and button controls - no touchscreen. Over the years the GPSMAP® 276C-series were among Garmins best selling consumer devices around the world. They still bring amazingly high prices on auction sites, like e-Bay, even in their discontinued-afterlife. Although Garmin has created several zūmo® and handheld devices targeted for the Motorcycle community, the discontinuance of the GPSMAP® 276C-series left a hole in the product line for many Motorcyclists which had not been filled - until now! The newly introduced GPSMAP® 276Cx All-terrain GPS Navigator is targeting Marine, Light Aircraft and Automotive (terrestrial) use - just like its predecessors. Although the new GPSMAP® 276Cx has similar features, this is not a dusted-off 276C. Completely new hardware and software make this device familiar, yet all new: GNSS (GPS+GLONASS), Wi-Fi, Bluetooth, ANT+, expandable industry standard micro-SD Card storage and a brilliant non-touchscreen display. There are audible Tone Alerts but no external speaker in the unit. The GPSMAP® 276Cx has two System Usage Modes, Automotive and Marine. These are basically profiles to manage the settings and present appropriate navigation features and functions between these two primary uses. I won't spend any time discussing the Marine Mode or it features since most Motorcycles/ATVs/Snowmobiles don't float. 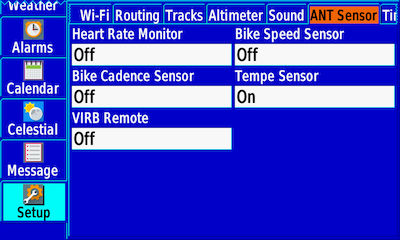 This time around the "Automotive" mode really means terrestrial since the Routing options includes all of the current Garmin Activity types from Walking to Mountaineering and Cycling to ATV/Off Road Driving. At 426g(15oz), I think this device might be a bit on the heavy side for use in some of the supported Routing Activities - like Hiking and Cycling - but who am I to judge. The 5-inch (800x480 pixels), very bright, back-lit display is one of the best sunlight-readable displays yet to come from Garmin. It has the same buttons-on-the-right layout and functions as its predecessors. And yes, buttons-on-the-right is not exactly Moto-friendly placement - keep in mind, just like its predecessors, this device wasn't designed just for Motorcyclists. For those who have only used a Garmin nüvi®, zūmo® or current handheld device, you'll have a small learning curve with the Menu structure but this certainly isn't the most complex User Interface among Garmin devices. The GPSMAP® 276Cx Owners Manual will give you a reasonable start up the learning curve - although, like other Garmin consumer device Owners Manuals it only covers the basic operations of the device. If you use a Garmin Montana or Monterra you'll be happy to know, or maybe not, that the GPSMAP® 276Cx uses the same Garmin AMPS Rugged Mount - and, if you use a wired-headset, the 276Cx can be setup to pass Audio Out through the cable in the mount harness. The same battery compartment design used by the Montana/Monterra has been incorporated here as well which allows the use of three AA Alkaline, NiMH or Lithium batteries in place of the standard 'brick' Lithium battery. The standard Lithium battery has a huge 5000mAh capacity and Garmin says you can get up to 15hrs from this battery. I think if you used the Battery Saver mode and allowed the display backlight to time-out after short peaks at the screen, it would easily last that long. The Garmin AMPS Rugged Mount has a security screw on top to make sure the device doesn't pop out. I never had a problem with my Montana or Monterra but the GPSMAP® 276Cx is considerably heavier so I would recommend using it - especially if you are traveling off-road. Hopefully, Touratech-USA will provide a locking mount for this model. One of the big shortcomings of the old Chartplotters was limited storage - both internal and removable. The new GPSMAP® 276Cx has 6GB of internal storage available to the user - not bad! But, just like the M&Ms (that's Montana & Monterra), underneath that huge Lithium battery is a micro-SD Card holder. Garmin says they officially support storage sizes up to 32GB SDHC but the GPSMAP® 276Cx had no problem reading the 8GB of Maps from my 128GB SanDisk Ultra SDXC card! The only downside to all of that storage, the user cannot chose where to save data when using the device. Currently, any Saved data will be saved to Internal Storage - not the SD Card. 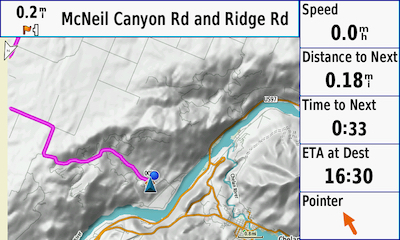 All Garmin consumer GPS devices have a power-up page that isn't the Map page and the GPSMAP® 276Cx is no exception. 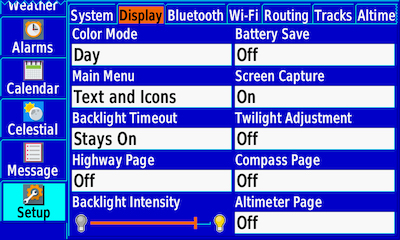 In keeping with its predecessors, the first page you'll see is what Garmin calls the Main Menu. I personally wouldn't have chosen the GPS Satellite page as my Main Menu but it certainly is the first page in this menu structure. As one of my many feature requests, I'd like to be able to choose the Map as my Power On page! The Main Menu of the 276Cx...Yep! They're still Blue. Most folks will just press the PAGE button to get to the Map Page. the buttons - it's all about the buttons! OUT & IN: Used to zoom Out and In on the Map Page. PAGE: Select to scroll through the main pages in sequence and to return to the home page. If you hold the PAGE button down, you can switch between Automotive and Marine mode. QUIT: Select to scroll through the main pages in reverse sequence, revert to the previous value in the data entry field, or cancel a function. ENTER & MARK: Select to acknowledge messages and select options. While on the Map Page, momentary press toggles Declutter. Hold this button to mark a Waypoint. MENU: Select to open the menu for the page you are on. Press twice to open the Main Menu. NAV & MOB: Select to open the navigation options. 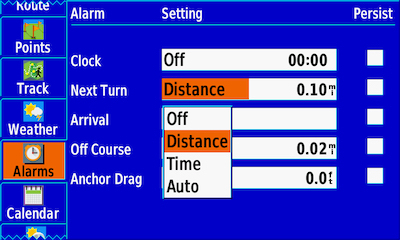 In Marine mode, hold to create a Man Overboard (MOB) and begin navigation to the MOB location. You can customize this button so that when you are in Automotive mode, with an active Route, you can press and hold to open the next turn page and replay the current voice prompt. : Hold to turn on and turn off the device. 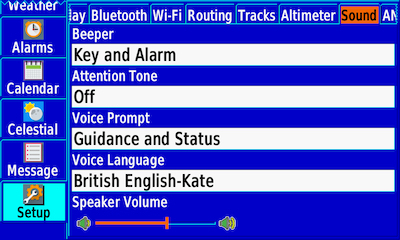 Select to adjust the backlight and external speaker volume. When in the powered Mount, pressing and holding for three seconds will place the device in Sleep mode. FIND: Select to find a destination. 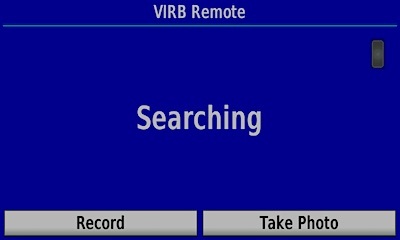 Pressing the FIND button twice quickly will give you the option of setting your current location as the HOME Waypoint. A long press of the FIND button will take you directly to the Recent Finds page. : Used to scroll, highlight options and move the cursor on the Map. You can move the cursor diagonally on the map - not just up/down or right/left. Pressing the NAV or the FIND button will provide the user with a wealth of functionality - much of what we do with a GPS starts with one of these functions. And, when it comes to accessing your data, you probably won't need to go much further than pressing one of them. NAVas you might expect, is about going somewhere. You can use the Compass to navigate to your destination or you can use the Map. 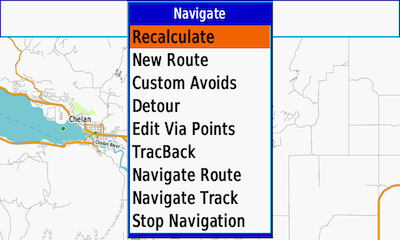 You can navigate a saved Route or Track and all of the most often used Routing features are back: Recalculate, Custom Avoids, Detour, Edit Via Points (including, adding multiple Via Points to an Active Route). Speaking of Maps, the GPSMAP® 276Cx does not come with a routable map so if you want Routing along roads, you will need to install your own routable map(s). I tested City Navigator North America and Open Street Map tiles for North America and a handful of countries around the world. You can choose how far along the original route path from your current location you want your Route to be recalculated. FINDbutton will bring up, you guested it, the "Find" page. Other Garmin On The Road ( Automotive/Motorcycle) devices would call this Where To. Press the Menu button while on the Find page and you can adjust where the device searches for Points of Interest, your Waypoints and Photos that have location data. You can also start your "Near Other" FIND search from the Map Page by panning the Map and leaving the cursor where you want to search then press the FIND button! In addition to the various search criteria, there is the Auto Arrange feature for the Find Page. Selecting (Enable) Auto Arrange will keep those POI categories most often used by you at the top of the list so they are quicker to access. 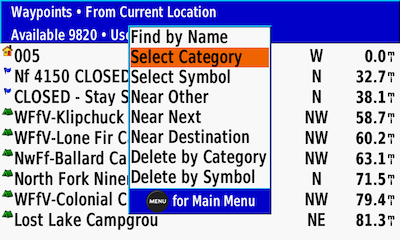 If you are using FIND to search your Waypoints, pressing MENU will present you with filters for your search. Using Symbol or Category as the filter criteria, you should have no problem taking advantage of the 10,002 Waypoint capacity of this device. Just keep in mind that in most cases the search is based upon a location radius of ~115mi (185km). If the 10,002 Waypoint capacity isn't enough for you, you can load your own Custom POIs into the /Garmin/POI/ folder in either Internal storage or your micro-SD Card using Garmins POI Loader application. Just like other current Garmin devices you'll find your Custom POIs in the Extras category. 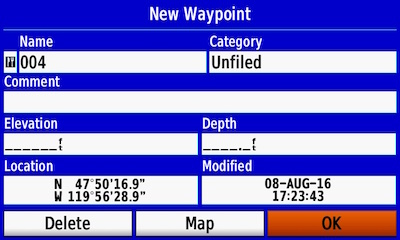 Pressing the FIND button and then selecting Waypoints is the best way to access your Waypoints if you have a lot of them stored on your GPSMAP® 276Cx. 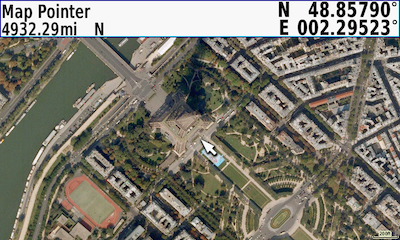 a search location by positioning the cursor on the map. Most of us have become accustom to the touch screen keyboards of our mobile devices. Some of you might even vaguely remember how we typed on early Cellphones that didn't have keypads. 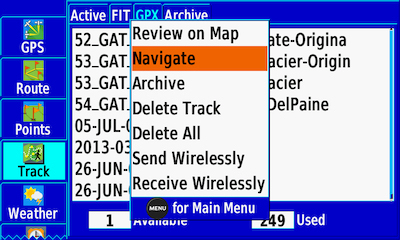 The GPSMAP® 276Cx uses the same type of cursor keypad to enter text. It only took me a few days to become accustom to using this form of input again. I'm a little faster than this animation in real-time. 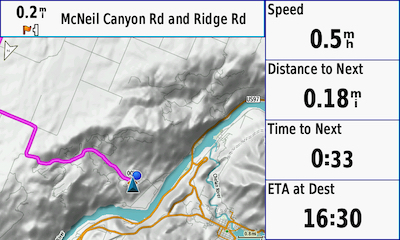 One capability that has been absent from Garmin devices since the discontinuance of the x76 Series Chartplotters was the ability to see more (minor) road data on the Map page at higher map-scales. Most of Garmins current devices with 5" displays have a resolution of 800x480 pixels and it was thought by many that they just didn't have the pixel density to show more data at zoom levels above 0.8mi(1.2km). Well, guess what?! Garmin has pushed the zoom detail about as far as they can on this new 276Cx as long as you're using third-party maps like those from OpenStreetMap (OSM) or Garmin Topo Maps. If you are, you will see minor roads out to a scale of 2mi (3.2km)! If you want to use Garmins City Navigator maps, minor roads will still disappear after the .8mi(1.2km) scale as they do on all current Garmin devices. The Map page is where most of us spend the majority of our time while using the GPS so it's only fitting to have some ability to customize the view and Garmin has not disappointed in that regard. You can change from Large to Small Data Fields as well as remove them altogether so that you just have the map. 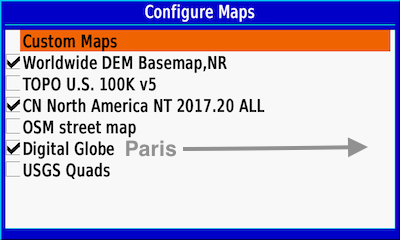 And then there is that iconic four-corner transparent Map with Overlay option. four-corner Map with Overlay Data Fields options are back! No Data Fields or Navigation banner...All configured by You! As with all of the current Garmin Motorcycle branded devices, you can install additional maps on the GPSMAP® 276Cx - either in internal storage or on your micro-SD Card. And, you are not restricted to using the old style gmapsupp.img naming convention. 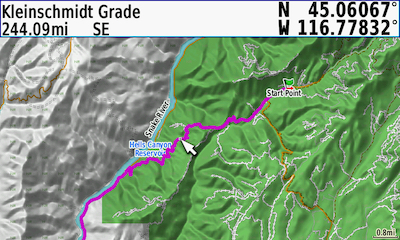 In addition to maps of various types you can also make your own Garmin Custom Maps as well as using Garmins BirdsEye Satellite Imagery and USGS Quads images from BaseCamp ($30/yr Subscription required). I won't cover them here but in Marine mode there is also support for Garmins BlueChart® and LakeVü™ Maps. to make them easier to manage on-device. 1yr Subscription to Garmins BirdsEye Sat Imagery is included. Imagery is available worldwide and at fairly high resolution - but that resolution can be inconsistent from location to location. 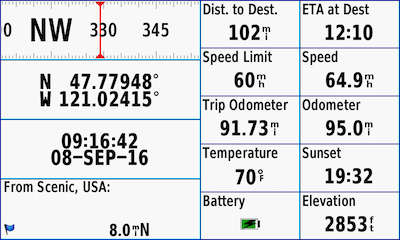 In addition to the Map Page, the Trip Computer, is always accessible via the PAGE or QUITE buttons. 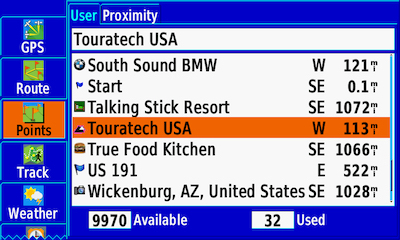 This page, like most, can be customized to show a 2 Columns version with changeable data fields, 4 Big Fields or the default Trip Computer (in Blue). 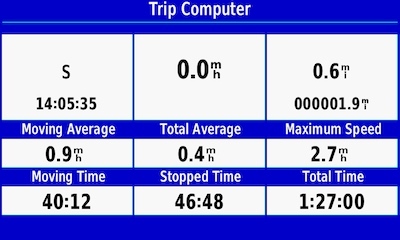 The Standard Trip Computer which is not customizable but you can reset the data between trips. The customizable 2 Columns version is my choice. That lower left data field is called Nearest Type. 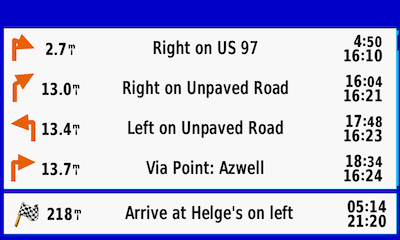 In addition to the above, if you have an Active Route you will see the Route Directions Page shown below. There are three additional pages that can be added to your PAGES/QUIT sequencing: Highway Page, Compass Page and the Altimeter Page. These pages must be activated on the Setup->Display settings tab. aside from additional data fields. The Compass Page...I added my tempe™ sensor data. 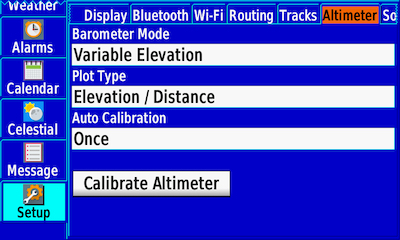 The Altimeter Page will show your Active Track Log and if you're doing a TracBack Navigation - as above. in the PAGE list when you're Navigating a Route. When you Power On the GPSMAP® 276Cx you're presented with the Main Menu which is where you'll find your data and the Setup Menus. A quick touch of the QUIT or PAGE button will take you to the Map Page. You can access the Main Menu (Blue) pages from anywhere by pressing the Menu button twice (Menu-Menu). These screenshots will look quite familiar to those who loved the original portable Chartplotter (276/376/379/478/479) Series of devices. After you have finished reading this article and familiarized yourself with your new GPS😎 the next thing you're going to want to do is load your Waypoints, Routes and Tracks into the GPSMAP® 276Cx and this device will hold a lot of them: 250 Routes, 250 Tracks along with 10,002 Waypoints! And, here is where you'll find the Route, Points and Track apps that manage your data. Let's take a look at each of the Main Menu apps. GPS in the GPSMAP® 276Cx is now a modern high-sensitivity Global Navigation Satellite System (GNSS) receiver and I found position lock to be quite fast once you have allowed for initial acquisition. 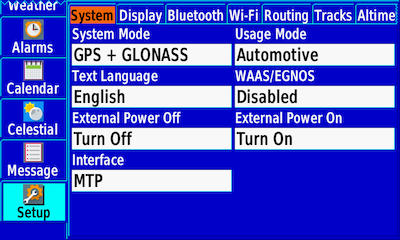 You can enable GLONASS as well as WAAS functionality by pressing the MENU button here or from the Setup->System page. There is an external antenna port just above the USB port on the back of the device for adding a remote antenna but you won't need it for Moto-use. Even in my home-office with morter and concrete surrounding it, this device always had 10-12 Satellite signals and a reasonably low position drift. It also did quite well on the road and in the back-country under heavy tree cover and deep valleys. 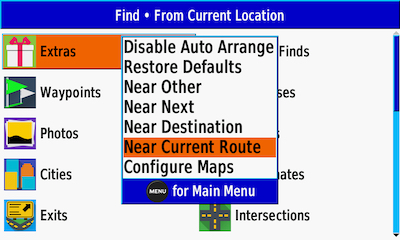 From here you can press MENU and configure your GPS Satellite options as well as Map view orientation. 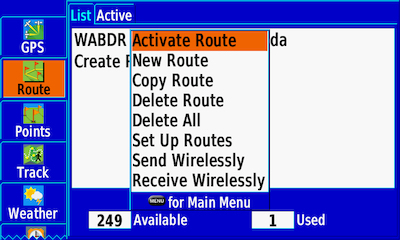 Route data manager can hold 250 Routes. If you want auto-routing you'll need to install a routable map like Garmins City Navigator Series or Open Street Map - the GPSMAP® 276Cx does not come with routable maps. A Route can have a maximum of 50 Via Points. 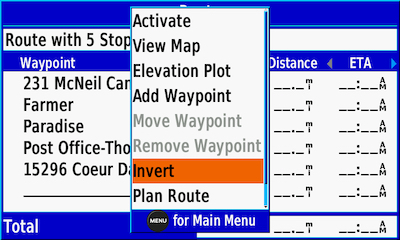 Garmin Via Point (won't alert), which are called ShapingPoints on newer zumos and the Navigator V, are not supported. 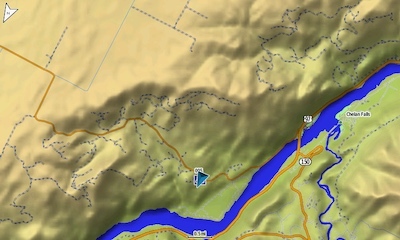 If your Route has Via Point (won't alert), created in BaseCamp or Furkot.com, they will be seen as regular Via Points by the GPSMAP® 276Cx. So, keep this in mind as you manage your Via Point count limit in a Route. Using Routing to navigate to a destination can be both advantageous and frustrating. Advantageous because of the information that is available to the rider. Frustrating because most riders don't really understand why the device created the route path it did based upon the pre-planned Routing data in the file that they themselves created or were given. 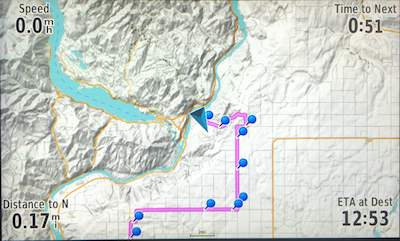 Another feature that has been missed for a while in many of Garmins devices marketed to Motorcyclists is the ability to join an Active Route without having to go to the Routes original Start point. As of Software Version 2.50, when you activate a Route, The GPSMAP® 276Cx will calculate the route path from the Start Point to the End Point of the Route regardless of your location with respect to the Route Start Point. You can join the Route anywhere along its path and the Route Directions will adjust accordingly. If you want to auto-Route to the Route Start Point you will need to do so manually. 250 Routes can be stored on your new 276Cx. Copy Route is a great feature if you need to do some editing on the device. Invert should work for you. Points data manager has a 10,002 Waypoint capacity! 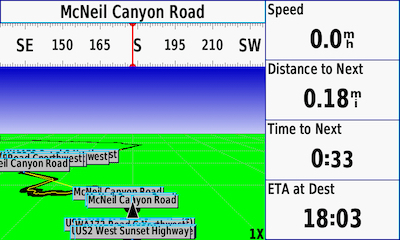 Garmin Waypoint Categories are supported. They are best accessed from the FIND function. 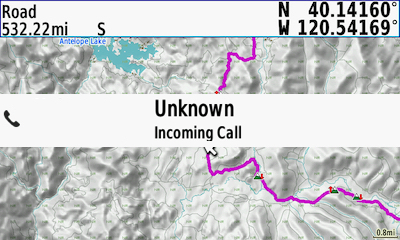 Categories can be assigned to Waypoints on the device as well as in Garmins BaseCamp, the old MapSource and the online Trip Planner Furkot.com. Custom Waypoint Symbols are supported and you can easily manage them with your computer and a Bitmap Editor once you know the naming convention. The GPSMAP® 276Cx uses numerical naming formats like those used on other Garmin Handheld devices: Custom 1.bmp, Custom 2.bmp, Custom 3.bmp, etc. You can't have more than 56 Custom Waypoint Symbols on the device. Keep in mind that if you share your Waypoints that use Custom Waypoint Symbols, the Custom Symbol doesn't travel with the GPX file. Custom Waypoint Symbols and Categories too! Track data manager can hold 250 Tracks. Each saved Track can have a maximum of 20,000 points. If you don't really understand the differences between a Route and Track, I offer my article on the topic: Routes, Tracks and Waypoints - The Other RTW. I will not cover the Flexible and Inter-operable Data Transfer (FIT) data formate supported on this device since currently it has no relevance to Motorcycle navigation. 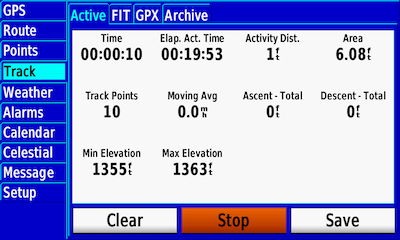 If someone does give you a FIT file with Track or Route data in it, you can just use it as-is or you can convert it to GPX data using an application like GPSBabel. When the need arises, you can actually choose what segments of your recorded [Active] Track Log you wish to save. It is not an 'on-map' edit process but at least it can be done. Along with Garmins TracBack for navigating back along your current Track Log, you can also Navigate any of your saved Tracks - in the Original direction or Reversed. will Start automatically unless you Stop it here! Track app on your new 276Cx. and follow the Magenta Road. 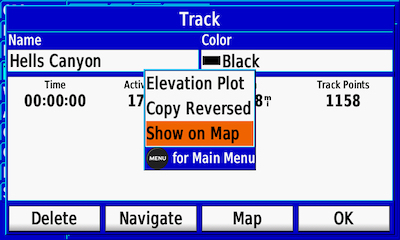 If you selected one of your Tracks, press the MENU button and you will have an option to show its Elevation Plot. Track detail - you can change the Color of the Track as it will be seen on the Map. To set Show on Map press the MENU button. Weather is a free data feed from your Smartphone but you must be running the Garmin Connect Mobile App (Cellular Data charges may apply depending upon your Cellular Service Plan). 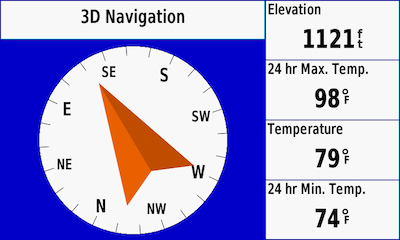 Current data is based upon the nearest Commercial Airport weather station. This can be okay or it could be hundreds of miles away form where you are. The good news is that the Map option can be zoomed out/in and panned to other locations and the radar data will be updated accordingly. Weather Map in Play mode. Six radar images from the previous hour. Alarms are just that and something you might want to experiment with especially when navigating a Track in difficult terrain with lots of confusing intersections. When you're Navigating a Route or Track you can choose when you want to be notified as you approach your Next Turn and Arrival. Calendar would be a great feature if it pulled data from your linked smartphone - it doesn't. This feature is really about Sunrise/Sunset and Hunting/Fishing "best" days & times. Celestial is another one of those Marine and Hunt/Fish features that most Moto-riders will seldom visit. 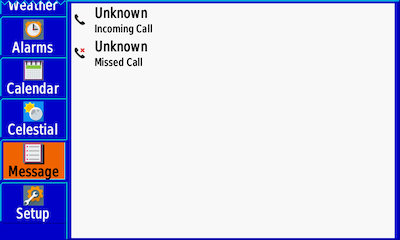 Messages is where you will find a record of the Notifications that were sent to the GPSMAP 276Cx from your smartphone, if paired, and you selected to Show Notifications in the Bluetooth settings. You can't do anything about them but at least you'll know. or you can just press QUIT! 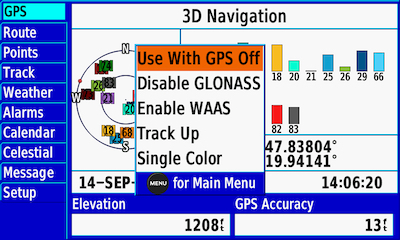 This is where you configure the basic operations of the GPSMAP 276Cx features. System: As you might expect this is where you setup the basic operating features & functions of the device. 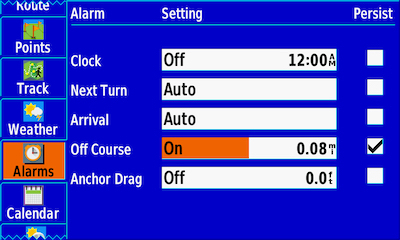 The Usage Modes of Automotive and Marine are actually profiles that allow you to have quite different settings between the two. 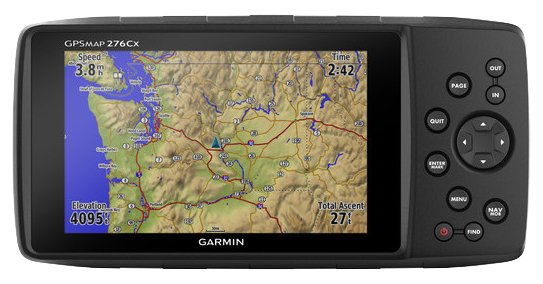 Another feature that Garmin On The Road device users may not be familiar with is the various Interface options for connecting this GPS to your computer or other Marine oriented devices. The MTP option will connect your device in USB Mass Storage Mode when you connect the device to a computer. 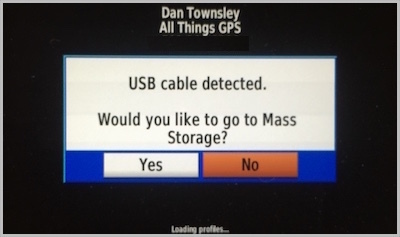 For those of you unfamiliar with Garmin Spanner mode, this allows the GPSMAP 276Cx to be connect to a computer or other USB Host device and transfer/receive GPS data and power while still functioning as a GPS device. This is handy if you have a computer application that needs an external GPS. The other Spanner option is to operate in USB Mass Storage Mode - just like MTP. Some of your most important settings are here. Display: Not a lot to say about the Display settings. But, you won't see the Highway Page, Compass Page or Altimeter (graph) Page unless you set them On here - I suppose those settings had to go somewhere. Click here if you want to go back to the additional Pages discussion above. The Twilight Adjustment feature, when set 'On', will remember where you set the Backlight level for Day and for Night Color Mode and automatically adjust the display backlight at twilight and at dawn - that is Sunset and Sunrise for your location. 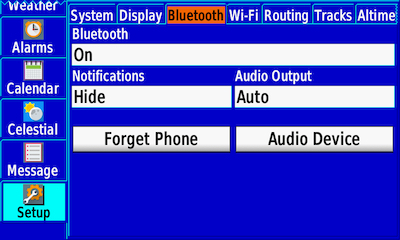 Bluetooth: has been a Garmin brand-to-brand data sharing option for quite some time. The GPSMAP® 276Cx uses Bluetooth to connect to your smartphone and your Bluetooth Headset as well as 276Cx to 276Cx data sharing. This device does not use the Garmin Smartphone Link App - it requires the Garmin Connect Mobile App (iOS & Android) to sync your FIT and Marine data with the Garmin Connect server as well as provide Weather data. 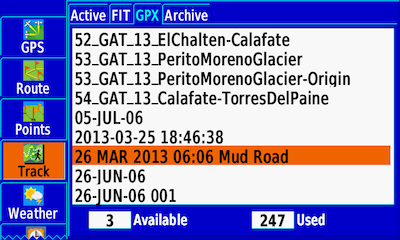 You can also Show or Hide your Smartphone Notifications on the GPSMAP® 276Cx as noted previously. If you want Voice Guidance from routable maps, the GPSMAP® 276Cx has no Speaker so here is where you can pair a Bluetooth Headset (Audio Device). Phone and Audio (headset) Pairing. Wi-Fi: Networks on the 276Cx should be configured using Garmin Express when connected via USB as they will have more function according to Garmin. 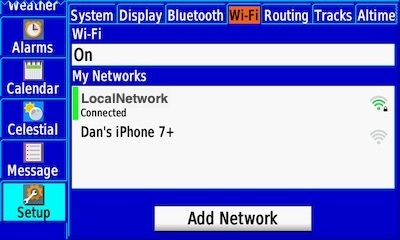 You can also configure Networks on the device and it will discover Wi-Fi access points in the area. The Weather Radar Map and Over The Air (OTA) software updates are supported. Select from My Networks...or, Add a new Network. Routing: in the 276Cx is much like it is in the newer Garmin devices that don't use the Garmin Trip Planner software and where Routes are still called Routes. 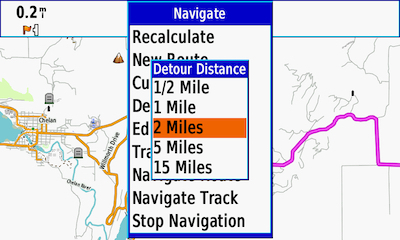 If you want your Route Calculations to be true to your planned route path, I recommend the Automobile Driving Activity and either the Minimize Time or Minimize Distance Calculation Method - I set my Calculation Method to Prompted so I can easily chose which one I think will do a better job for any given Route. Using Curvy Road as a Calculation Method can often times be an adventure. 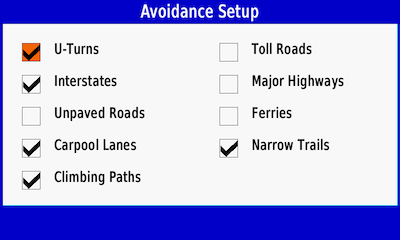 Each of the Activity modes can have its own Avoidance Setup. 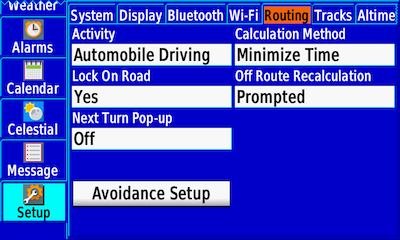 Treat the Activity like a profile for your Route calculation behavior. Try making changes to Activity and Avoids for a specific Route so you can see what happens to the Calculation. Avoids help shape your route calculation. Tracks: is where you setup the defaults for the Active Track (Log) Recording and Archiving. 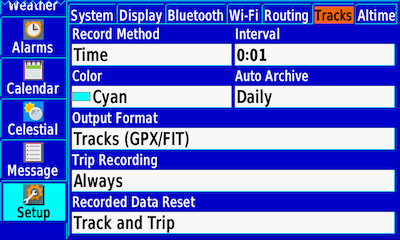 The Trip Recording feature will initiate a Garmin LiveTrack at Garmin Connect. 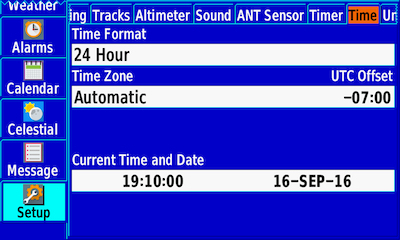 If set to When Tracking, you will only get a LiveTrack recording when you have an Active Track [Log] being recorded. the LiveTrack will record - Always! 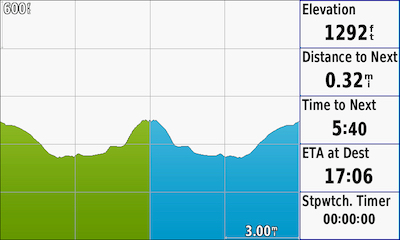 Altimeter: in the GPSMAP® 276Cx will be familiar to Garmin Handheld users. 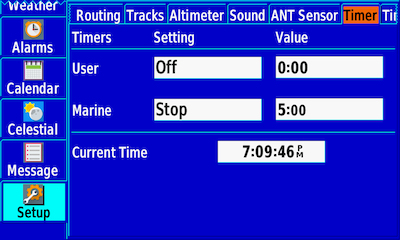 The current Track Plot is shown on the Altimeter (graph) Page using the options you setup here in Plot Type. 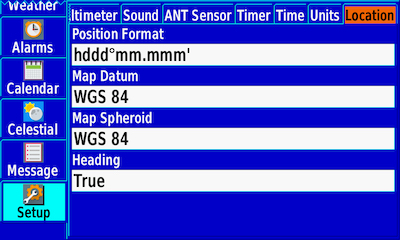 Sound: as you might expect, the basic settings. Alarms and Voice Guidance are quite loud - both from the Internal Tone generator and Bluetooth Audio - remember no internal Speaker. 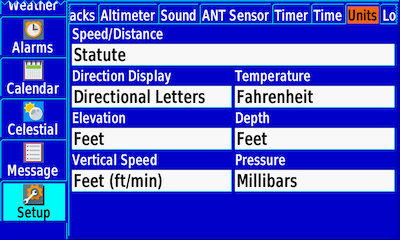 ANT Sensor: ANT is used for Sensor Monitoring. For Moto-perposes the Garmin tempe™ temperature sensor is quite handy and you can show the 24hr Min/Max and current temperatures in any Page that has customizable data fields - like my Compass Page screenshot above. In addition, the Garmin VIRB® action cameras can be remote controlled from the 276Cx. As for the Heart Rate Monitor, Bike Speed Sensor and Bike Cadence Sensor, it would seem like the GPSMAP® 276Cx is a rather large and relatively heavy device for use on a Bicycle. 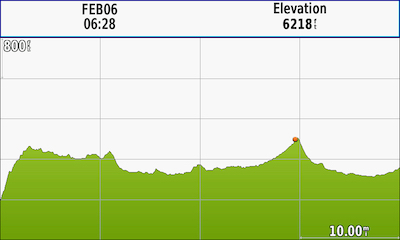 Although, the Heart Rate Monitor data might have been good for a few laughs on a couple of rides I've been on. can be remotely controlled by the 276Cx. paired quickly and re-connections are reliable. Having succumbed to a total-air-loss flat front tire off-road, I know the value of a tire pressure limit Alarm. It would seem a natural for Garmin to include their Tire Pressure Monitor Sensor to the ANT Sensor options - but if past experience is an indicator, I doubt it will happen. Timer: unless you're cooking dinner on your engine, you most likely won't use these very often. These Timers would be very awkward to use as Enduro Timers but the Regatta folks might find them helpful. Time: another one of those basic setup pages. Garmins Timezone Map data works quite well so Automatic is my choice. Units: again, here are your basic settings. Like all Garmin devices it is a worldwide product. Location: is where you select your coordinate Format and Datum. Most folks will use the standard WGS 84 Datum. most riders will ever consider changing. All of the more commonly used Position Formates are here but most will keep the default or choose one of the other Lat/Lon options. OK, that is about all I can cover here so now it is up to you. So, maybe you're thinking this might be your next GPS and that the price of the GPSMAP 276Cx isn't a real show stopper. But, if you just aren't there yet, keep reading. If you've read any of my previous GPS articles, or attended one of my seminars, you know I use the following "Basic Criteria for an Adventure Riding GPS" to determine if any GPS is something I would recommend to our clients - or anyone else. Let's see how the GPSMAP 276Cx features and functions stack-up.